I've thought about it a lot, and have finally decided to paint the hull blue after all. A slightly deeper blue than the blue you can see on Lady Jane at present. A blue hull with a white superstructure will look really good. Kate is also keen that we paint her hull blue, so that's an easy decision to make really. I know I'll have to buy more paint but, on reflection I also get the benefit of up to date technical advice from marine paint companies. I'm learning that marine paint is a little more involved than household emulsion. I also realise that if I get this paint job all wrong it could be very expensive, so a little time spent on checking up is going to be time well spent. I have started research into paints and primers and have come across Hempel, through a booklet we picked up in Jersey. The folks there have been very helpful so far. 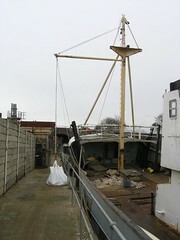 The working platform is now in place, and is already making the painting the hull project much easier. The picture shows me standing on the platform, just after I moved it alongside Lady Jane. It is much bigger than I first thought and is comprised of massive timbers bound together. Measuring 2.3 metres by 8 metres (7ft by 24 ft), the whole thing must weigh a good couple of tonnes, as even with two people standing right on the edge it does not tilt. Perfect for the job in hand. I'm quite proud of the pulley arrangement I have set up, which allows the platform to settle alongside Lady Jane as the tide goes out while keeping it snug alongside when the tide is in. One unexpected problem with the platform was that it skids away from the side of Lady Jane, down the side of the pile of mud squished up from when she settles. I'm hoping this will eventually stop as the mud pile, which was not that big, gets worn away by the platform, so I can get to the hull below the waterline. Next I will need to get hold of some scaffolding to go onto the platform, so I can reach up to the top of the bow section, provided, of course, the muddy swans are not on their nest. 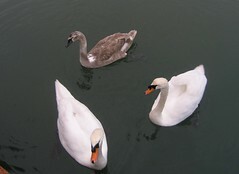 I'm pleased to say that the muddy swans, George and Mildred, are still using the nest right in front of Lady Jane. 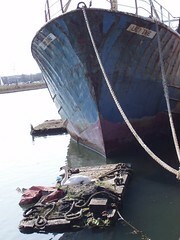 If you look at the picture, you can see one of the swans sitting beside the nest, surrounded by old ropes and suchlike. Given the muddy walk to the waters edge, the state of the platform the nest is on and, now, the proximity to Lady Jane, I'm really surprised at the swan's choice of nesting site. The muddy swans are definitely a distraction, and are hard to ignore when they come drifting by in search of tidbits - as Jason, another volunteer who came down with me to work on the boat, found out. It is remarkable how they drift along so effortlessly in search of food. I try not to disturb them when they are on the nest, even though this means walking the long way round between Lady Jane and the truck. Still no eggs in evidence though. 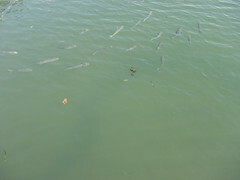 Now here's a first for me, loads of fish in the water beside Lady Jane. I scambled for the camera, but in the event the fish stayed for ages, apparently basking in the warm, shallow, water as the tide started to run out. I'm told they are probably mullet. I've seen the odd fish around Lady Jane before, but nothing like this. Apparently there are quite a few types of good eating fish for the taking in Fareham creek, and it's not unusual to see folks fishing on the opposite bank. Now where's that fishing rod? A little while ago I bought a fishing rod, reel and all the trimmings, but have not had the time to put it all together. I'm hoping we can haul them out like we did in Florida. Barbequed fresh fish on board Lady Jane on a warm evening, accompanied by friends and a good quality wine sounds pretty much idyllic to me. The weather has been perfect for working on deck. Yesterday was probably the best weather we have had so far this year. Here is Steve, a recruit with plenty on his mind, hammering away at that rust. He must have enjoyed it as he has already volunteered for more. Progress on the rust busting project has been slow, but steady. Thanks for the help Steve, it's much appreciated. No boat story today. I've got some serious housework to do. 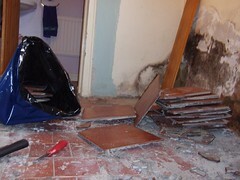 What was supposed to be a simple re-painting of the utility room has turned into a big project, as removing some old cupboards has revealed a major damp problem. The painting the hull project continues. It's definitely harder work than I first thought. 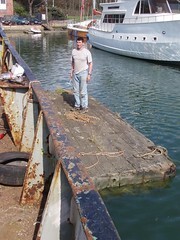 The next step will be to drag a working platform round from the other side of the yard. As I said, there is one right by Lady Jane but George and Mildrid have first dibs on it, although I've not seen evidence of them using it the last time I was there. Maybe they don't like being so close to Lady Jane. As you can see from the picture it's quite big and cumbersome, but will be very sturdy to work from. I think that with a scaffold structure built onto the platform, I should be able to reach and paint pretty much all of Lady Jane from it, some ballast in the bow would also help. 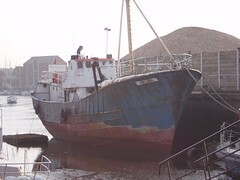 So far the tides have not been co-operating, as it will need a high tide to float it off from where it is now. I plan to inflate and launch Baby Jane to help drag the platform around, else I'll be there forever. Problem is, once I've got Baby Jane in the water I'll want to set off and explore a bit. I've always been fascinated by the tides, more so now that I have Lady Jane than ever before. Maybe this fascination is because I'm originally from Zimbabwe, a landlocked country. For me, the only significance of tides has previously been how far it was to walk to the waters edge when swimming at the sea side, and not much else. More recently, with the diving, the tides have affected times when we could dive. Ideally we would dive on a wreck with a low, slack tide, or on a drift dive with the tides running, but it has always been someone else who worried about all that stuff. The tides certainly have much more significance for me now. 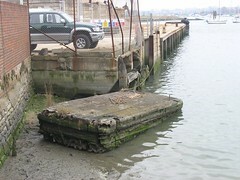 At Fareham, as you can see from the picture, when the tide goes out - it really goes out. You can see how the boats at the little marina next to Lady Jane are all left sitting high and dry for a good few hours each time the tide goes out, roughly twice a day. 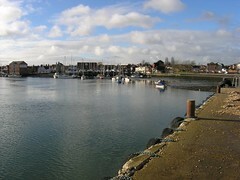 The tidal range, which is the difference between the water's depth at high and low tide, in Fareham is up to 5 metres (15 ft). The tidal range changes constantly from just a few metres (6 feet) up to five metres, depending on the phase of the moon. Interestingly enough, according to the tide tables I got in Jersey, the tidal range there is up to 11 metres (33 feet). Some range! Bling bling. That's all I'm saying right now. I've started work on painting Lady Jane's hull. Last week I had a marine engineer on board, for general advice and an initial discussion on how best to approach the extensions I'm planning for Lady Jane. One main thing that came out of it was a changed painting priority. I was thinking of painting her from the top down. The engineer pointed out that the hull is far more important, and that the worst bits should be dealt with first. If you look at the picture carefully, you can see a darker patch where I've made a start, right in the middle of the rusty bit, at the top. I know it's only a small bit, but things will pick up as I get into the rhythm of it and I'm through the worst of the rusty stuff. The process I've adopted to prepare the surface for painting is to knock away the worst of the rust with a small, sharp, chipping hammer, then work on the tougher tuff with an air powered scaler, followed by rubbing down to as smooth a finish as possible with a wire brush attachment on an angle grinder. Quite tough, physical work. Once the surface is prepared I'm using Rustroy for rust treatment and as a primer. The dark patch you see in the picture is the Rustroy, which goes a dark purple once it has been applied as it reacts with the rust to form an iron-tannate compound. Finally I'll paint Lady Jane with two coats of white paint. I would prefer a blue hull but she will be white, simply because I have over 150 liters (30 gallons) of white paint on board. Following on from the last post, I've been thinking about Lady Jane's neighbours, the Swans. I think I'll call them George and Mildred. Looking back for a picture of George and Mildred together I see they are never far away and at least one of them are in quite a few of the pictures I've taken. Here they are with what must be one of last year's brood. I was wondering how I could tell which was George and which was Mildred, but have not found the answer yet. I asked Foogle, but have not seen a reply to my question yet. I was sitting on deck in the early evening, watching the generator blades spinning, when I heard a strange noise from below the boat. Curious, as ever, I went and looked over the side to see what I think has been the strangest sight I've seen in a long time. A pair of swans, filthy with mud up to their necks, squelching their way through the soft mud beside Lady Jane, making for the water which is behind Lady Jane at low tide. As you can see from the picture, these poor guys were really struggling through that mud (click on the picture for a larger view). I'm told that the large wooden platform immediately in front of Lady Jane, which floats on the tide, is the swan's annual nesting site and that they have not missed a year on it yet. Pity, as I was thinking that it would be handy to stand on while working on the hull painting project, and I don't see the swans wanting to share it with me. Now I don't know about you, but if I was a swan I'm not sure I would choose a nesting site which took so much effort to get to and from the waters edge if the tide was not co-operating. I think of the earache I get from Kate when I come home with muddy boots after walking the dog. 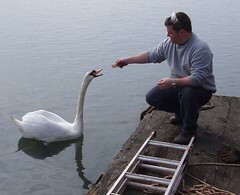 Will Mr Swan have the same problem I wonder? Not that he has a dog of course. Maybe this nesting site is at the cheaper end of the swan housing market. Still, on the positive side, I suppose predators would have a hard time of it too. I'm looking forward to seeing the Swan family story unfold over the coming months, and will post updates here periodically. As I've said before, the sheer diversity of things going on around Lady Jane are a constant source of pleasure for me. The picture you see is the wind powered generator installed on top of Lady Jane's mast and, I'm pleased to say, it's working perfectly. Both Robin and I were grinning like a pair of schoolboys, scampering between the battery bank to watch the volt meter and the deck to watch the generator blades spinning. It's hard to beat that intense feeling of satisfaction, the result of completing what proved to be quite a challenging project. The wind generator project originally started over six months ago, in July/August last year, with research into the various wind powered generators available. The generator from Eclectic energy fitted the bill perfectly, though it was a brand new design so I had to wait a few months for delivery as they had not started manufacturing at that stage. A worthwhile wait as the generator has that solid, well engineered, feel to it. The process of building the generator was pretty straightforward, as was completing all the wiring required. Buying the extra bits and pieces proved a little frustrating and there was some confusion over the 24 volt ammeter at one point. The cutting and welding ended up taking far longer than originally anticipated, simply on account of the weather and Robin's availability on the days I was to work on the boat. Although a little frustrating, nothing could be done about it. As it was, the final lifting and fitting was done by Robin in a bitter cold wind. The manufacturers recommend that in five years time the generator's bearing seals should be replaced, and that I can expect it to run for at least ten years. A good thing really, as it is fitted into that pipe at the top pretty solidly and will be a job to get back out. The photo montage tells the story. 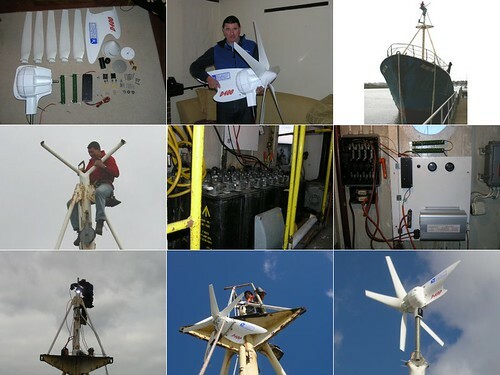 The middle picture is the battery bank, after all - keeping the batteries charged is the whole reason for the wind powered generator. This project could not have been achieved without Robin's help, thanks Robin. 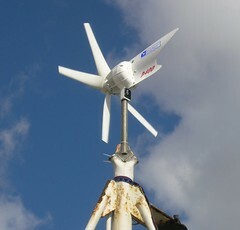 One project which is very close to completion, but still not there yet, is the wind turbine project. A combination of weather and timing has made this particular project a little harder to crack than I first thought it would be when I got the generator. Finally though, everything is in place - except the generator itself. I've even got a temporary gantry set up, to safely hoist the generator into position. 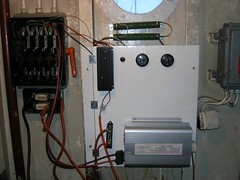 The picture shows the panel holding the electrics relating to the wind generator and batteries. The silver box is my 240v invertor, which will run the fridge and freezer and any other appliances which will need to be permanently left on. There is also space for a second invertor which will handle any other low power mains requirements. Hopefully this weekend will see this project completed and my precious batteries kept fully charged by wind power in the future. One thing I'm not sure of is how the generator will cope with the effect of the tide which constantly changes the angle of Lady Jane's mast from the vertical as she floats and then settles back down into the mud again at low tide. Who would have thought that a wind turbine would be the catalyst for me getting ballast in the bow, so as to trim the boat out properly, thus minimizing the effect of the tide. I was only intending to worry about that before I next took her out to sea. So far it's rare to have a project complete, from end to end. The clearing of the debris inside the fish hold is just such a project though. When I first bought Lady Jane there was a substantial amount of debris, mostly comprised of broken concrete and wood, left inside the fish hold. 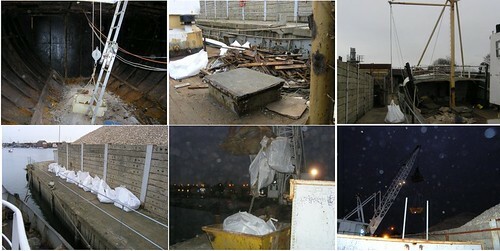 The photo montage shows the story of the project to empty the hold. Dave and I cleared the debris onto the deck one Sunday, from there I bagged and lifted the debris onto the wharf side, then dragged them round to a skip (I think you guys call them dumpsters in the US), Robin then dropped the bags into the skip with the crane. The last picture you see in the montage is the skip disappearing into the night. It will be picked up and dumped in a landfill site somewhere, never to be seen again. Oh the satisfaction of a completed project. There is so much for me to learn in so many areas. I'm still learning where to get things, as so much of what I need is outside of my current experience. In this case I originally did not even know what I needed, let alone where to get it. 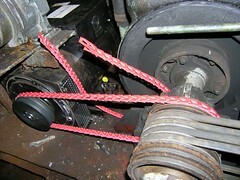 The picture shows how the new alternator, in the bottom left of the picture, is connected to the donkey engine. The red drive belts you can see are a special type which are designed to drive machinery using any length needed by simply joining the required number of pieces, similar to joining the links in a bicycle chain. It has the advantage of being easy to fit in the middle of a shaft. I never knew you could get belts like that, being used only to continuous drive belts like the fan belts you get on a car. I did have the option to fit continuous belts, but felt the extra expense for belts which could be fitted without having to upset the existing generator setup was probably worth it. I would otherwise have had to loosen the existing generator, completely undo the bearings on one end of the drive shaft, thread the new belts through, then tighten everything up. My experience is: If stuff works, don't mess with it unless you absolutely have to. Fitting the alternator is nearly complete, needing only final welding in place, fitting the second belt and welding the adjusting screw brackets so as to allow tension to be maintained on the drive belts. Oh, and painting the fittings so as to keep the rust off. Once fitting the alternator is complete, the job of wiring up the new mains system can begin. Here's a view from behind Lady Jane. 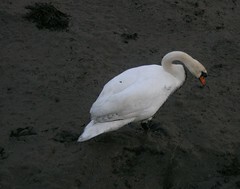 I always think that she looks a little sad when the tide goes out and she is left stranded in the mud. The sunshine, after a a spell of cold, wet, weather means a resumption of my various deck projects. Sadly it's been one of those occasions where I know I was busy, but have little to show for the effort. 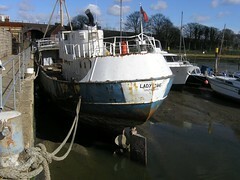 The next deck project will be to paint Lady Jane, rubbing down and repairing sections as I go. The second part of the plan for Lady Jane is where we will take her, after all Lady Jane, although a little old, is tough, as she was built to fish in the harsh conditions up in the North Sea. This potentially gives us the freedom to take Lady Jane just about anywhere, except landlocked places of course. The current plan is to start by taking Lady Jane on short journeys, say to places like Weymouth for a long weekend, then build up our skill and confidence with progressively longer voyages to places like Jersey. As things come together we can then be more adventurous, maybe taking her home to Zebrugge or on trips to western France. In the longer term, my ideal would be to do relatively short trips with long stays at locations that take our fancy, slowly working our way round to a particular goal, rather than setting off on a round the world type mission. I envision friends and relatives flying out to join us at choice locations, and us flying home periodically, maybe for a break, or even to work for a while. 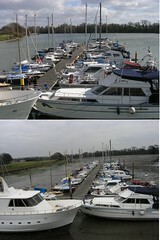 The picture shows the view we have of Fareham from Lady Jane. Fareham is, in some ways I suppose, our first long stay location. Kate and I have good friends who have a place in Tenerife, which sounds like a tempting first major objective. Tour Western France, hang out in Portugal for a while, on to Gibraltar then down the Moroccan coast, stopping off at Casablanca, nip across to the Canary islands, then finally Tenerife itself, a journey of anywhere between 2,500 nautical miles and 1500 nautical miles, depending on the route we take. Places I'd really like to take Lady Jane include the Antarctic and Alaska for the stunning scenery and wildlife and the Mediterranean and Caribbean for the warmth and lifestyle. This all seems such a long way off at the moment though. The BBC has published an excellent article on using news readers to access Real Simple Syndication (RSS) pages. What these readers do is automatically scan their RSS feeds, such as mine at http://timzim.blogspot.com/atom.xml, and automatically notify you when any updates to that location have occurred, for example when I add a new blog entry. There are several readers listed in their article, I use Sharpreader, which works well for me. This blog entry is unashamedly about rigging, so Karen if you are reading this you may as well stop right now! When I first bought Lady Jane, about eight months ago now, the previous owner mentioned vaguely that 'the boom could be rigged for lifting'. At the time I, for the life of me, could not work out how to do it. The lifting boom is the boom you see standing out horizontally in the picture, supported by ropes and with a load suspended under it. Thanks for the bags Tony. It took a trip to Oostende, Belgium to see Amadine, a restored fishing trawler very similar to Lady Jane, for me to finally work it all out. It has taken a while to measure everything up and find a supplier who can provide the right pulleys and ropes so as to ensure that everything will be safe for the loads I will be lifting. 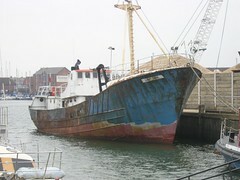 Thanks to the folks at Hamble Ropes and Rigging for the help and advice. This rigging discussion has been going on for some time now, some of it in my local pub, which explains Karen's rigging comments. Kate, it has to be said, is not too enthusiastic about hearing any more about rigging either. I'm sure the boat people reading this would wonder what all the fuss is, but the ability to lift things on and off Lady Jane has, understandably, been a major issue for me. I'm not trying to justify anything here, but I can now lift pretty much anything on and off Lady Jane. This includes being able to hoist Molly, the dog, on board and, using a chain block, launch and recover the rib. Without the new lifting gear I could never have cleared the rubble we left on deck.